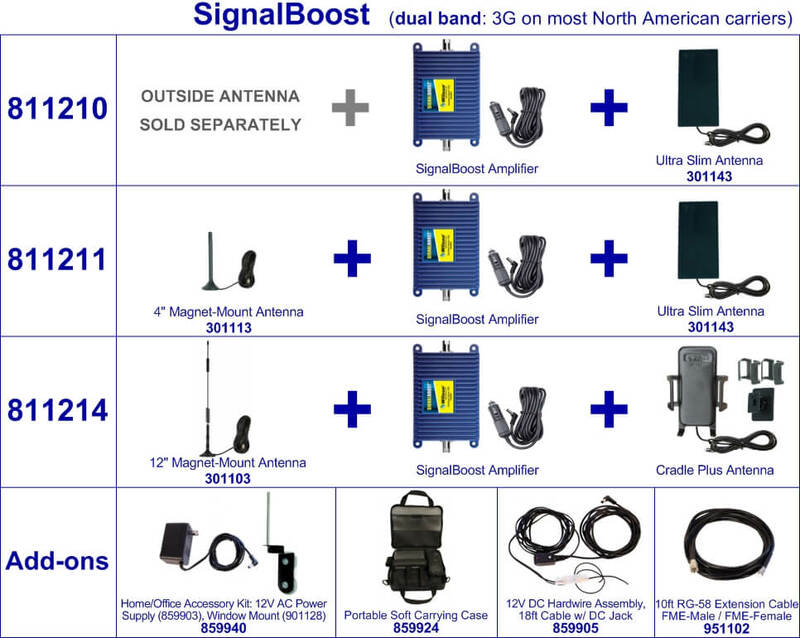 The SignalBoost amplifier is a wired direct-connect style solution capable of boosting all North American 3G/EDGE signals (except iDEN, WiMax). A wired solution includes an exterior antenna to pull the signal, an amplifier to enhance the cable and a tool which attaches directly to a phone or data card. This amplifier comes in three different kits (811210, 811211, 811214) all designed for a vehicle setting. The 811210 requires the purchase of an exterior antenna allowing for a choice of any vehicle or trucker antenna. The 811211 and 811214 are both complete kits. The 811210 is a kit which includes the SignalBoost amplifier, DC car charger, and the low-profile ultra slim antenna (301143). The amplifier includes an FME-Male port for an exterior antenna. The low-profile antenna which comes with this kit attaches to a phone using a velcro strip and includes a 7.5-foot RG-174 cable with FME-Female connector. The 811211 is a complete kit which includes the SignalBoost amplifier, a DC car charger, a low-profile ultra slim interior antenna (301143), and a 4-inch magnet mount exterior antenna (301113). The low-profile interior antenna attaches a phone or data card using a velcro strip. The discrete 4-inch exterior antenna mounts onto the top of a vehicle using a rare-earth magnet making it easy to install and remove. The magnet is very strong and able to withstand the speeds of fast freeway driving. This antenna includes a 10-foot RG-174 cable with an FME-Female connector. The 811214 is a complete kit which includes the SignalBoost amplifier, a DC car charger, a cradle with a built-in inside antenna (from 301146 Cradle Plus), and a 12-inch magnet mount exterior antenna (301103). The cradle with built-in inside antenna provides the boosted signal to a device which is placed in the cradle. It includes a mounting clip which allows for the cradle to be mounted securely to a dashboard using 3M tape. The exterior antenna mounts onto the top of a vehicle using a rare-earth magnet and includes a 10-foot RG-174 cable with FME-Female connector. There are SignalBoost Add-Ons available. To use the SignalBoost in a desktop setting, there is home/office accessory kit (859940) which includes a 12V AC power supply and a steel-construction window mounting suction cup bracket for a magnet mount antenna with a long radial to minimize oscillation between the exterior and the interior antennas. There is also a soft carrying case (859924) which is designed specifically for the amplifier allowing for an easy move between different settings. To hardwire the DC power supply into a vehicle to avoid using a cigarette lighter port, there is the 12V DC Hardwire Assembly with 18-foot cable (859905). And for larger vehicles or building settings, there is a 10-foot extension cable (951102).